Prior to Jutland HMS Yarmouth had been involved in the search for the Emden and had sunk one of its colliers and captured another. Connected to both the Yarmouth and Jutland, is the interesting story of “Rutland of Jutland”. Attached to the 3rd LCS was the seaplane carrier HMS Engadine. On 30 May 1916 Beatty ordered Engadine to make a search to the north-northeast. 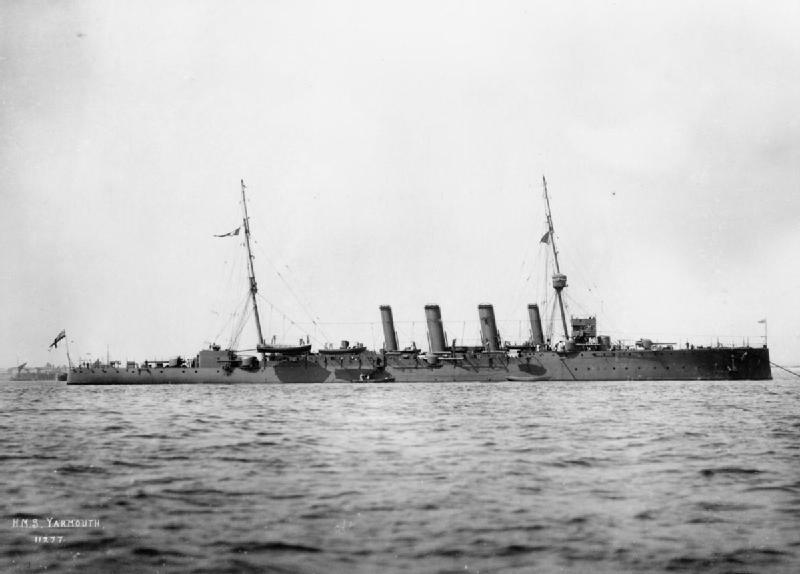 At 15:07 Lieutenant Rutland took off in his Type 184 and his observer, Assistant Paymaster G. S. Trewin, signalled Engadine that they had spotted three German cruisers and five destroyers at 15:30. This was the first time that a heavier-than-air aircraft had carried out a reconnaissance of an enemy fleet in action. Rutland was awarded the Distinguished Service Cross "for his gallantry and persistence in flying within close distance of the enemy light cruisers". During the Battle of Jutland, the armoured cruiser HMS Warrior had been crippled by numerous hits by German battleships. At 19:45 Engadine attempted to take her in tow, but the jammed rudder prevented that until it was trained amidships. Early the following morning Warrior 's progressive flooding had worsened and she was sinking. The captain ordered his ship abandoned after Engadine came alongside to take the crew off at 08:00. About 675 officers and men successfully made it to the much smaller Engadine. Among these were about 30 seriously wounded men who were transferred across in their stretchers; one man fell from his stretcher between the ships, but, against orders, Rutland dived overboard with a bowline to rescue him. For his bravery he was awarded the First Class Albert Medal for Lifesaving in gold. On 28 June 1917, Flight Commander Rutland took off in a Sopwith Pup from a flying-off platform mounted on the roof of one of the gun turrets of the light cruiser HMS Yarmouth, the first such successful launch of an aircraft in history. He received a second award of the DSC in 1917 for "services on patrol duties and submarine searching in home waters". However the story does not have a happy ending – Rutland resigned his commission in 1923. He had come to the notice of MI5 in 1922 when the agency had received what it called "reliable information" from a "very delicate source" that the Japanese had had secret talks with Rutland. MI5 noted that Rutland possessed "unique knowledge of aircraft carriers and deck landings". He had subsequently been providing technical details which helped the Japanese design aircraft carriers, in the years before the attack on Pearl Harbour. This was discovered when Japan's cyphers were broken. MI6 discovered that Rutland had come to the attention of the US authorities. He returned to Britain on 5 October 1941 and on 16 December 1941 he was interned under Defence Regulation 18B "by reason of alleged hostile associations". Rutland committed suicide in 1949. At Jutland Yarmouth was attached to the 3rd LCS (Light Cruiser Squadron) and formed part of Beatty’s fleet - on the fleets outward passage to Jutland a periscope sighting was reported by Yarmouth, which turned out to be mistaken, but caused Beatty to change direction for approx. 20 minutes. Not an auspicious start to Jutland but during the battle the Yarmouth expended 160 6in shells – second only to Falmouth (also in the 3rd LCS) – together they expended a third of all the 6in shells fired by Light Cruisers in the battle. Ships they engaged with were the Wiesbaden, Lützow, Derfflingger and various destroyers. Yarmouth also fired a torpedo at fired at the Lützow but missed. Commissioned into service and attached to the 4th Battle Squadron Mediterranean Fleet Aug./13-Aug./14 on the China Station and joined in the hunt for the Emden Captured ExGreek Pontoporus, one of Emden's colliers in Oct./14 and sank the collier Markomannia joined the 2nd Light Cruiser Squadron Grand Fleet 1914 then the 3rd Light Cruiser Squadron at Rosyth in Feb./15 took part in Battle of Jutland attacked unsuccessfully by a U boat Jul./16 rejoined the 2nd Light Cruiser Squadron 1918 became temporary Flagship at Cape in June 1918 before returning home for refit assigned to the 7th Light Cruiser Squadron South America from 1919 to 1920. placed in Nore reserve from Dec./20 attached to signals school at Portsmouth 1922 to 1924 refitted Dec./24 to 1925 and then undertook trooping runs from 1925 to 1926 back at signal school at Portsmouth in 1927 became Flagship of the Rear Admiral of Submarines at Falmouth from April to October 1928 put in care and maintainence and sold for scrap in November 1928. Jon - Thank you for all the materials on Yarmouth.